Jaded Blossom: Guest Designer, Rosie! Hi Everyone! Rosie here! I'm very excited today is my day to celebrate Jaded Blossom's birthday. They are celebrating all month and you will be inspired by so many crafters. I created a 1st Birthday layout, I really love the way it turned out. 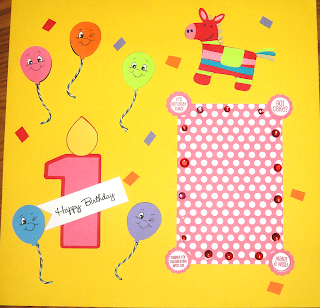 I also included a donkey Pinata, you have to have a pinata when celebrating a birthday. This is so cute! I love the birthday kisses stamps as corners of the frame. This is super adorable! LOVE the birthday kisses in the corners! GREAT job!! Love the bright colors! Great LO! Rosie great use of the candies stamps! What a cute layout Rosie! TFS! How adorable! I love the kiss stamps for the corner holders. great color combo! That is very pretty =) Great job !!! This is really cute!!! Love the faces on the balloons --great touch! Such a stinking cute layout!!! LOVE IT!! Love this layout! Wish I did more layouts.. Seeing yours makes me wanna go craft and make one. I'm not a scrapper, but I love this! What a great way to celebrate a first birthday! I LOVE this layout..So bright, colorful and happy! super cute! very festive...and i love all the bright colors! Aaaaw, adorable layout! I love the balloons and the little PK faces-so stinken cute! This is just the cutest layout. Love all the fun and bright colors. And I love the Peachy Faces! Super sweet layout Rosie. I love the colors. They are so bright and cheery!! Fabulous job. You ROCKED it. TFS and for being a guest designer. yay!! I love to see layouts! very cute! Very cute layout Rosie-bright & happy!! Thanks for sharing! Cute layout! And I agree, who doesn't want a pinata at their party?! What a fun project!! Peachy! I love bright layouts. Really like the twine for the baloon strings! Very festive birthday layout. I love bright colors and the way you used the Birthday kisses to anchor the photo to the page. Great job and thanks for sharing. Your layout is ADORABLE! I love the colors! Super cute! Love the birthday layout! Fun bday lo. Happy Birthday Jaded Blossom! Love the layout. Bright colors bring a smile to my face. What a fun and colorful layout! Cute layout! Love the colors! What a fun, bright layout! Thanks so much for sharing!